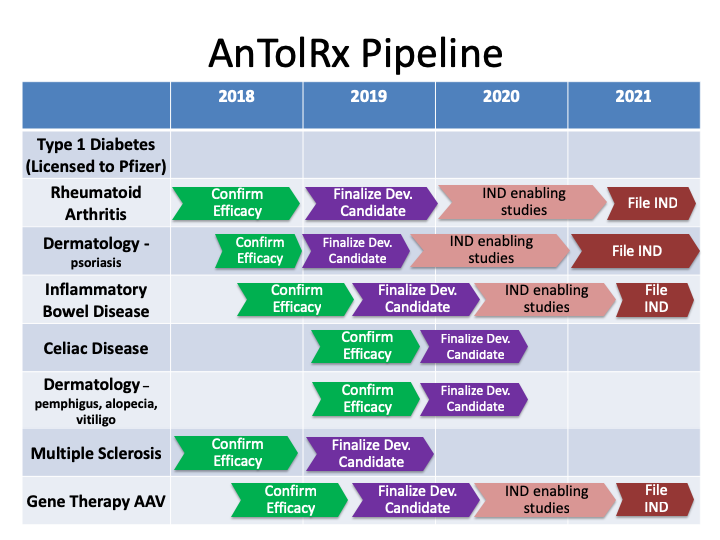 AnTolRx is revolutionizing the treatment of autoimmune diseases through the development of novel, targeted therapeutics utilizing specific self-antigens and unique tolerogenic molecules to actively promote immune tolerance. 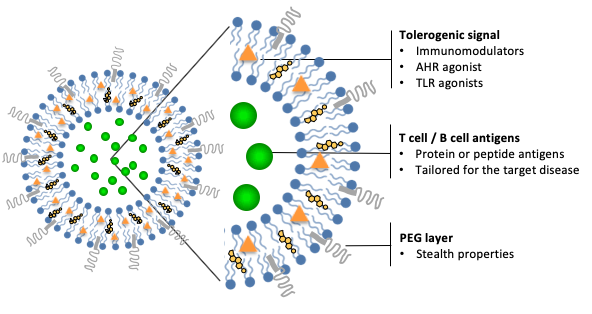 Our patented nanotechnology is designed induce antigen specific immune tolerance. The tolerogenic molecule is designed to induce a strong anti-inflammatory signal and promote tolerance to our desired antigen. Such molecules include ligands of the aryl hydrocarbon receptor (AHR) which induces immune tolerance through the induction of anti-inflammatory pathways and the suppression of pro-inflammatory signals. The antigen is the target of our tolerogenic signal and can be a protein, peptide, or collection of peptides. With the versatility of our nano formulation system, this component can be customized to target antigens relevant to any autoimmune disease. We are rapidly advancing a potential therapy for the treatment of Type 1 Diabetes through partnerships with Pfizer, Inc. and JDRF and are advancing pre-clinical programs in a number of other auto-immune related diseases, including Rheumatoid Arthritis, Psoriasis, Inflammatory Bowel Disease, Celiac Disease, Myasthenia Gravis, and Multiple Sclerosis.